To become a flight nurse, you need the ability to spend long hours in a plane or helicopter without feeling sick and the ability to provide patients with care until you reach a hospital. Flight nursing and critical care nursing are two fields that share a number of similarities. Critical care nurses work on ICU wards and in areas where patients are near death. Flight nurses often work in the same situations, but they work on board planes and helicopters that transport patients to the nearest medical facilities. Before beginning your career, find out which steps you need to take. Every flight nurse working in the country today has a nursing degree from an accredited college or university. The first year you spend in the program covers the basic skills that nursing professionals need, including how to work with patients and take vital statistics. After taking some more advanced courses, you will need to complete your clinical rotations. Nursing students work in hospitals and other medical facilities under the guidance of professional nurses and doctors. They have the chance to work with patients and gain practical skills. Before you can become a flight nurse, you need to pass your nursing boards. This refers to the examination offered by the National Council Licensure Examination for Registered Nurses, and some students call this the N-CLEX. Prior to taking the test, students must go through a background check with the state. They then take a computerized test that asks more than 200 questions about pharmacology, nursing ethics, mental health and diseases. If you pass the test, you will see your name added to the Board of Nursing in your state. Those who fail the test can pay to retake it again. 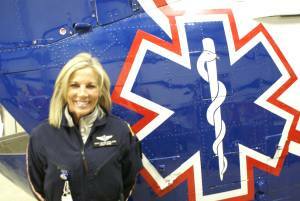 Flight nurses deal with emergency situations and must have the ability to make split-second decisions. Most companies and hospitals will not hire nurses for those positions unless the applicants have at least three to five years of clinical experience. This can include working as a paramedic or working in an emergency room. As most hospital emergency rooms will only hire those with some additional experience, you need to work your way up. Working as a nurse in a retirement home, on a pediatric floor or in a doctor’s office can help you gain some experience that will let you apply for emergency room positions. According to Nurse Without Borders, you need board certification to become a flight nurse. The Certified Flight Registered Nurse Certification is a test administered by the Board of Certification for Emergency Nursing. The Board requires that you have several years of experience in clinical care or emergency room nursing and a license to practice nursing in your state. Certification is also required of those working as military flight nurses. Some military nursing positions are open to those without a military background, but you will need to go through some training before working independently in the field. Flight nurses help patients who suffer from injuries after a car accident and those traveling from one hospital to another facility. Though they lead exciting lives, you need to know that the job is difficult. If you still want to become a flight nurse, start with a few nursing classes at a local college.